VANCOUVER, Feb. 11, 2019 /CNW/ - Callinex Mines Inc. (the "Company" or "Callinex") (TSXV: CNX) (OTC: CLLXF) is pleased to announce that it has a commenced a deep penetrating induced polarization ("IP") survey at the Company's 100% owned Pine Bay Project (the "Project") located in the Flin Flon Mining District of Manitoba, Canada (See Figures 1 and 2). The IP survey will be completed by Abitibi Geophysics using their proprietary OreVision IP system, which can reveal targets at four times the depth of conventional IP. 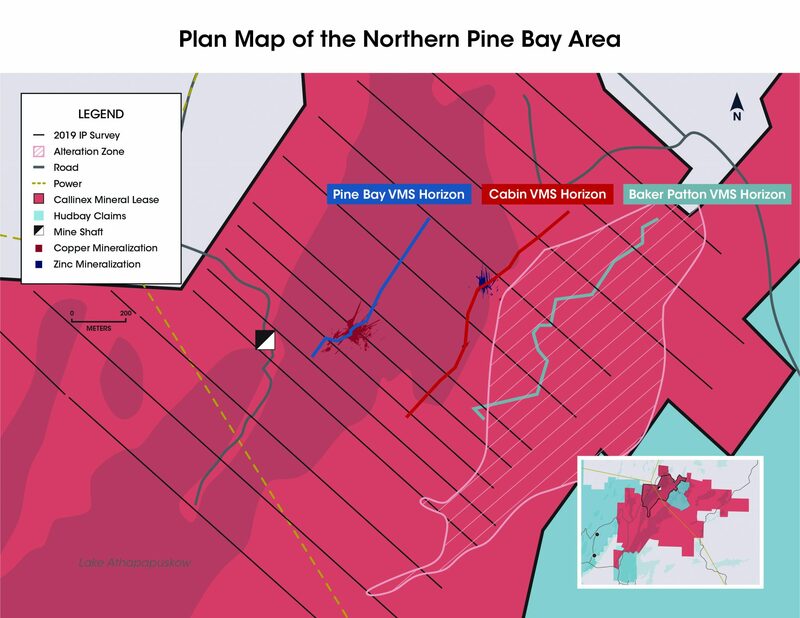 The objective of the survey is to detect pyrite-rich mineralization that may host high-grade copper and zinc up to depths of 580m along three favorable volcanogenic massive sulphide ("VMS") horizons that host the Pine Bay, Cabin and Baker Patton deposits. In late-2016 the Company discovered a high-grade zone over 10.3m that assayed 6.0% Zn, 1.8 g/t Au, 60.4 g/t Ag, 0.7% Cu and 0.4% Pb by extending a Placer Dome Inc. drill hole by 38 meters (See News Release dated October 18, 2016). Notably, Placer Dome Inc. completed a borehole electromagnetic survey, which did not provide any geophysical indications of this high-grade zone. Additional drilling by Callinex also intersected several intersections of pyrite-rich mineralization that was unable to be detected with conventional electromagnetic methods. 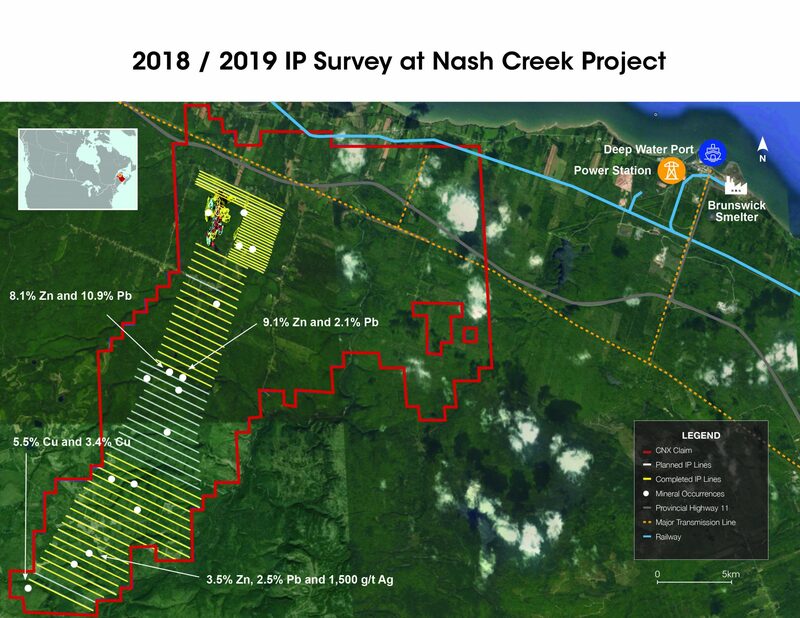 To date, approximately 156 line km out of a planned 190 line km have been completed at the Nash Creek Project located in the Bathurst Mining District of New Brunswick. The remaining portion of the survey is anticipated to be completed in the early-spring as a result of significant snowfall associated with recent storms in the area. The Company will announce results from the IP survey upon completion of inversion modelling. The Company is also pleased to announce that Killian Ruby, President and CEO of Malaspina Consultants Inc., has been appointed as Chief Financial Officer for the Company. Mr. Ruby is a Chartered Professional Accountant and was formerly an Assurance Partner at Wolrige Mahon LLP (now Baker Tilly Canada), and prior to that a Senior Manager with KPMG, working predominantly with public companies. The Company thanks Mr. Anderson for his services as CFO and wishes him continued success in his future endeavours at Malaspina. J.J. O'Donnell, P.Geo, a qualified person under National Instrument 43-101 and a Consulting Geologist for Callinex, has reviewed and approved the technical information in this news release. Callinex Mines Inc. (TSXV: CNX) (OTC: CLLXF) is advancing its portfolio of zinc rich deposits located in established Canadian mining jurisdictions. The portfolio is highlighted by its Nash Creek and Superjack deposits in the Bathurst Mining District of New Brunswick. A 2018 PEA outlined a mine plan that generates a strong economic return with a pre-tax IRR of a 34.1% (25.2% post-tax) and NPV8% of $230 million ($128 million post-tax). The projects have significant exploration upside over a district-scale land package that encompasses several high-grade mineral occurrences along a 20 km trend. Click here to view a video overview of the Nash Creek Project. Callinex has a project portfolio that also includes projects within the Flin Flon Mining District of Manitoba that are located 25 km to an operating processing facility that requires additional ore. The Company's projects host Indicated resources of 13.6 Mt averaging 3.2% Zn Eq. totaling 963 million pounds and Inferred resources of 23.2 Mt averaging 5.2% Zn Eq. totaling 2.7 billion pounds (See News Release dated April 16, 2018). Some statements in this news release contain forward-looking information. These statements include, but are not limited to, statements with respect to future expenditures. These statements address future events and conditions and, as such, involve known and unknown risks, uncertainties and other factors which may cause the actual results, performance or achievements to be materially different from any future results, performance or achievements expressed or implied by the statements. Such factors include, among others, exploration programs and the timing and amount of expenditures. Except as required under applicable securities laws, Callinex does not assume the obligation to update any forward-looking statement.